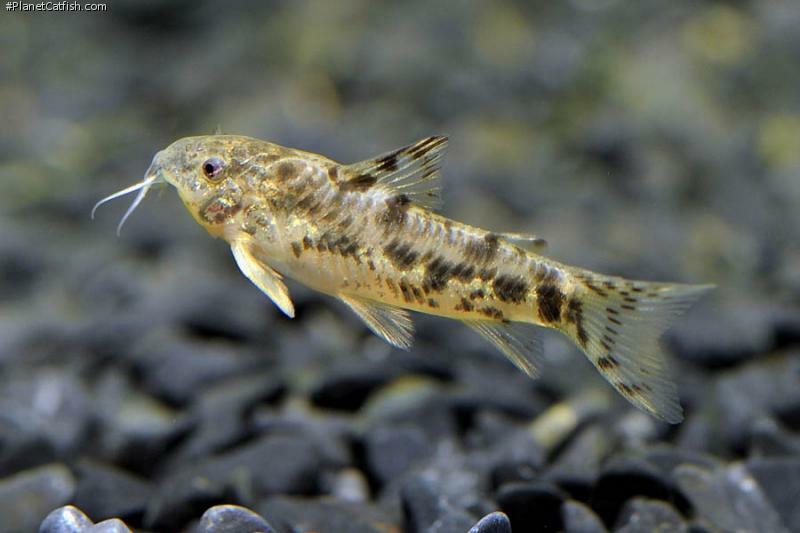 Ian Fuller is one of the worlds most accomplished Corydoras breeders; what sets him apart from many of his peers is that he is also an international speaker, author and runs the successful corydorasworld.com site. He is also much of the driving force behind the UK's catfish study group. Sometimes I think there is actually more than one of him, as he clearly spends so much time and energy on his fascination with the subfamily corydoradinae. Therefore we're delighted that Ian takes some of this time to produce the following article feature on Aspidoras depinnai so that we can feature it this month. Aspidoras depinnai is one of the smaller Aspidoras species, barely reaching 40mm standard length for a full-grown adult female; males rarely exceed 35mm SL. Differentiating this species from other Aspidoras species can be a bit of a problem, as many do look very similar, however in this case they are a little easier to identify having four fairly large distinctive dark blotches along the centre of the body, the three rear most blotches having a secondary smaller blotch below. There is also a single dark broad horizontal band across the dorsal fin. This is a very active species, which I have found is best kept in groups of at least six, preferably more, two males to each female being the optimum ratio, this ratio is definitely advantageous if you are intending on breeding them. As with most Corydoradinae species a fine smooth grained sand substrate is a must, along with some vegetation to give this little fish as near natural environment as possible. I tend to use potted Anubias coffeefolia a very dark leaved species that does not need a lot of light to be able to grow well and free floating clumps of Java Moss. Another thing that is also important and this is the case with many if not all Aspidoras species, is that there should be plenty of movement in the water. Most species are found in fast flowing streams and when breeding the females tend to favour depositing their eggs in areas where the water is most turbulent. This was certainly the case when I first spawned them in November 2008, one of the two females deposited all her eggs in the uplift tube of the air driven sponge filter and for a subsequent spawning I created a small waterfall using an outside hang on filter, where upon both females deposited all of their eggs on the sloping out run of the filter, which was about 12 mm above the surface of the water in the spawning tank itself. This meant that the females had to swim up the out flow and onto the ramp to place their eggs. An ingenious evolvement I thought as in this position the eggs would be safe from most water born predators and probably with the rippling of the water they would be very hard to be seen by birds from above. This is an ideal species for the smaller aquarium and compared to some of its congeners it is quite outgoing and not so skittish as many others. They are however quite secretive when it comes to the act of mating, which I found out after watching them for several hours, trying to get images of the intimate act. Most of the mating took place under the clumps of Java moss and only once did they venture out into the open. One important thing to remember with this and other Aspidoras species is because of their liking to swim up into on coming water flows, they can and often do swim up the corners of their tanks and if there are any gaps, can swim straight out of the tank altogether.